Hazelnut Coffee Energy Bites. I love hazelnuts. I love coffee. So I decided to put them together to make these Hazelnut Energy Bites. You guys! These are super delicious and very easy to make. I got some coffee extract the other day and I made some Coffee Chocolate Oatmeal Bites. Those were delicious, but I knew I wanted to make some sort of no bake treat with it as well. That is how these Hazelnut Coffee Energy Bites came about. We are still prepping for our upcoming kitchen renovation and trying to use up what we have in the pantry. I just happened to have a bag of hazelnuts that needed to be used. 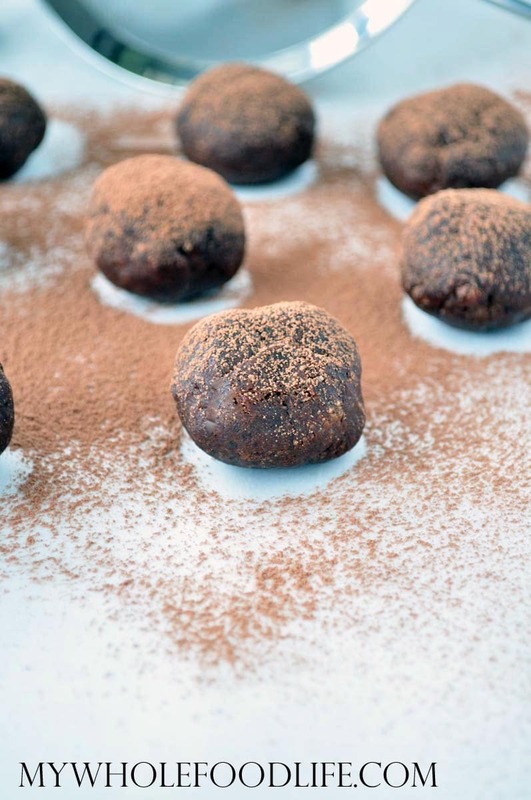 These no bake energy bites are vegan, gluten free and paleo approved. All you need is 5 simple ingredients! They take just minutes to whip up too. If you like coffee treats, you may also enjoy my 3 ingredient coffee popsicles. Looking for more coffee flavored treats? Enjoy the flavors of coffee and chocolate in this no bake treat! In a food processor , grind up the hazelnuts into a coarse consistency. Add in the remaining ingredients and mix well. Slowly, a little bit at a time, add some water. Just enough to get the mixture to clump together. Stick in the fridge to firm up. Keep these in the fridge or freezer. They should last a couple weeks. Enjoy! Oh my! I need to make these. Maybe to have as a snack with my coffee. ;) Thank you for posting the recipe! You had me at coffee and chocolate! These look delicious, thanks for the recipe. Thanks Kayla! I love the flavor combo in this one! I could only find it on Amazon. Here is the link if you want to check it out. http://tinyurl.com/lr9zacl You could probably use instant coffee grounds, but I am not sure if brewed coffee will work in this particular recipe. sound yummy! Hazlenut is my favorite coffee or latte flavor. I wonder if some espresso powder would work? I know extra energy, but I have that on hand. I made them with Medaglia D'Oro Instant Espresso Coffee powder and they were AWESOME! BEST treat I've made from your website so far, Melissa--frikkin' delish. Brought them to a house-moving event & they were scarfed up in no time! Yay!! So glad you liked them Amy! You can make your own coffee extract. 1 cup vodka to 4 Tablespoons espresso powder. Yes these look wonderful! I am not sure. Maybe 3/4 cup? I made these last night using almonds and sunflower seeds. I did not have the coffee extract, so I put espresso powder into vanilla extract. YUM! Thanks for the inspiration! YUM! This looks delish and so easy! I'm late to the party. To keep these paleo/Whole 30, can I skip the chocolate chips? Maybe add some ground vanilla beans? The espresso powder would probably have to replace the coffee extract if it can nations alcohol. Thanks for any tips you can provide! I think you probably could. Or maybe you can use carob chips? I made these last night. Delicious! They taste just like those Ferrero Rocher chocolates in the gold foil! I also tried them last week, but I used macadamia nuts because I didn't have hazelnuts. Also super yummy! Thank you for a wonderful recipe!! Awesome Michelle! So glad you like them!